Magellan’s Gift Micro Soap Company Brochure ~ Click on the Brochure to read! Magellan’s Gift is owned and operated by Lori Curry, Saponification Artist, and Handcrafted Soapmakers Guild Member. Consistent quality and safety are a number one goal of Magellan’s Gift™ Micro Soap Company. Soaps are cured for at least 4 weeks. This makes the bar harder and longer lasting. Before a batch of soap is released for sale, it is tested for 3 consecutive days by 3 of my skilled soap testers. The bars are best used within 3 months for full scent, especially those containing citrus essential oils. In addition to detailed work on batch quality and good manufacturing procedures, bar soaps have smooth beveled edges for a better shower experience. Make sure to rest your soap where it will dry between uses for a longer lasting bar. Some of the soaps contain nut oils which may be allergens to some, so if redness or irritation occurs, discontinue. Keep out of eyes. If you have sensitive skin, try wetting the bar and applying a small spot under your arm. Check for sensitivity in eight hours. Watch carefully in the shower for mermaids, giant squids, and other old-world sea creatures. This soap has been known to let your mind travel to faraway places! An order ready for shipment! 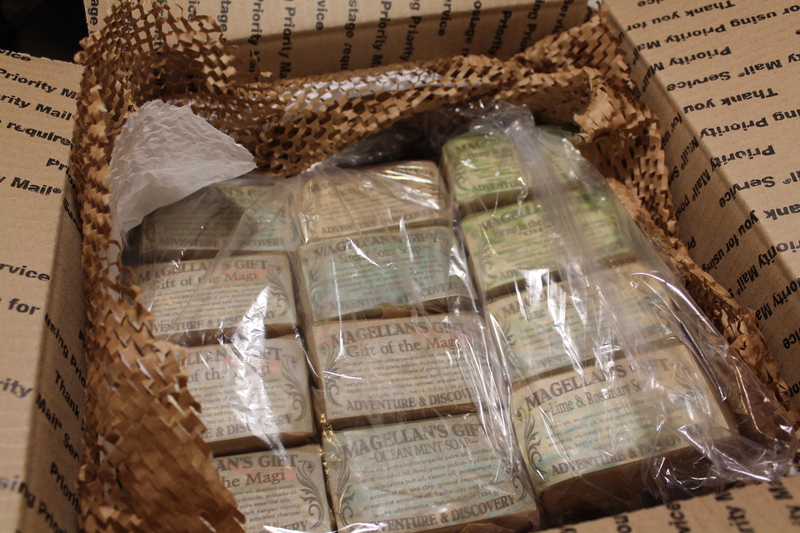 Magellan’s Gift recycles supplier’s packaging and wraps soap in a compostable eco-deli wrap. Next, we hope to print with more earth-friendly ink. All paper has at least some recycled content. Fancy Boxes and bags are available on request for gift giving. Pricing varies. 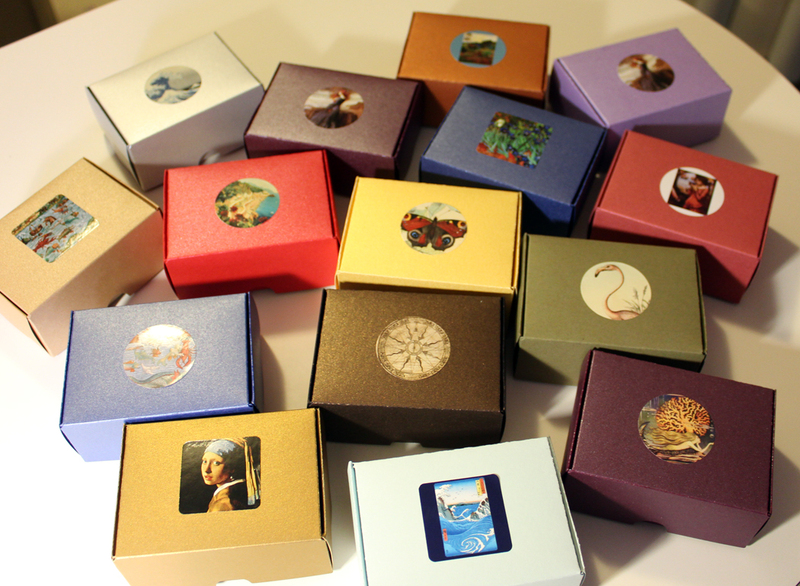 Boxes available featuring fine art stamps. These are just beautiful! How long have you done this? I’m a newbie and just started. I have yet to make a decent batch of soap , (Lye). Cannot get out of mold, ( even freezing), still soft. Yes, I did achive trace as I know thats a big component to the out come. Was not fond of using this method, but I gave it my best. I’m very disappointed, as I am very talented and patient with other craft making. My homemade potpourri is my signature. So can you give me a hint of your recipe or what I could do to sucessful ? I’m going to try the MP but I would like to add shea, coconut etc. to enhance, add lather, which I do not know if I can even do that! I just want to make a few bars for myself and family. If you can give me some guidance I would appreciate. Once again, you have a wonderful art!!!!! I sadly have no time to teach, but I hope to give classes and do e-books myself when I retire and do this full time. I do recommend Amy of Soap Crone http://www.soapcrone.com/ I enjoyed her e-books. She is great at answering questions too. I have no problem paying for good information, but she is resonable too. She has a good You Tube clip on liquid soap making also. There are good books out there too. Tell her I recommended her! Best wishes – You’ll be doing the soaper’s happy dance soon! Hi, do your bars of soap contain any Sodium Lauryl / Laureth Sulfates, or any Sulfates at all?